I ate my way across 2018 with a special gusto for Philly’s stunningly diverse flavors and an eye toward endurance. You just don’t make it through 400-plus restaurant meals in a year with a smile unless you acknowledge that this lucky task is an epic adventure that unfolds one dish at a time. So which bites stood out as the most special? Looking back at the last 12 months many thousands of plates later, the year as a whole was a unique feast, from my extensive journey through South Philly’s rapidly expanding Mexican food community to the dozens of reviews I wrote for the Sunday paper, umpteen Good Taste features, hundreds of Crumb Tracker Quiz clues, a sunny trip to the Jersey Shore, and all the research meals for this year’s Ultimate Dining guide (200 restaurants strong!) that paid special homage to the Philly classics. Yes, I inevitably nibbled through plenty of sorry clunkers along the way. It’s just part of the reporting process. And do not worry: I didn’t suffer. Because, inevitably, some special dishes rose up like gold in the pan and will forever linger in my imagination as the best of 2018. I’ll gladly hold on to those, thank you, so … cue the highlights! Click a restaurant to jump to a review. I ate so many memorable things during my deep dive into the wonders of Mexican South Philly, from the surprise of my new favorite enchiladas rojas at a folding table in the market aisle of tiny La Tienda grocery, to the mole-sauced lamb chops at El Rancho Viejo and, of course, the always transcendent lamb tacos and consommé at South Philly Barbacoa. But I cannot stop thinking about the tamales from Tamalex. 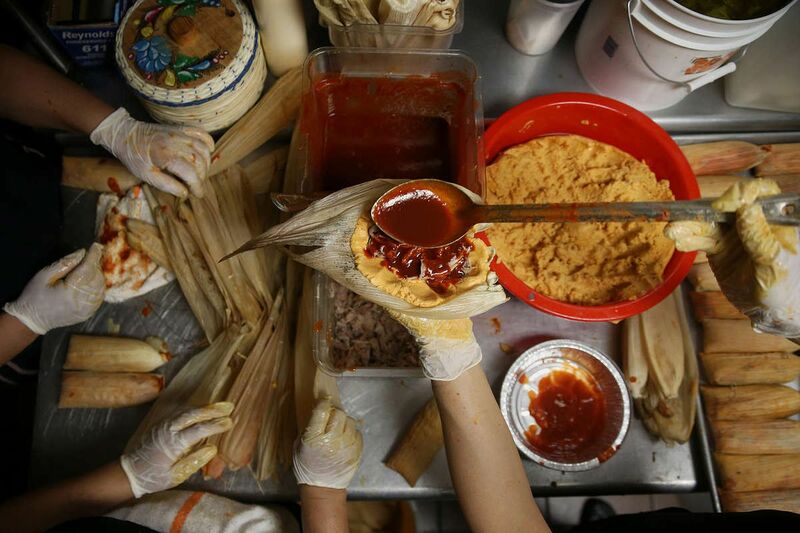 Four women work throughout each weekend night hand-filling thousands of corn husk bundles with moist masa dough, tender meats, and vivid salsas, red and green, and then pack them tightly into a giant pot for a slow steaming. By 8 a.m., when those foil-wrapped packages of fluffy tamales begin flying out the door ($6 for three), the air is sweet with the earthy smell of corn and the true taste of Puebla-delphia comfort. Tamalex, 1163 S. Seventh St., 215-465-1665. The chicken wings are stuffed at the Boba and Co. food truck in South Philly with Cambodian-style lemongrass sausage. Golden Phoenix at Boba & Co.
A silky custard enriched with crab fat hides beneath a medley of seafood and asparagus at Cadence. The ricotta casoncelli with a black trumpets and mushroom crema at Andiario in West Chester. The Abu Sayf grilled halibut kebab at Suraya is dusted with grated black Omani lime. The fried scallops at Mayer's Tavern. The Peking duck is pictured at China Gourmet in Northeast Philadelphia is memorable. The Boucherie burger at Royal Boucherie. Cauliflower-Epoisses gratin with Parker house rolls at Helm Rittenhouse. The chicharron – flash-fried beef tendons, kesong puti cheese and scallions – are a crispy hit Sarvida, a new Filipino restaurant in Fishtown. A Philly classic meets the smoker in the pit-smoked brisket cheesesteak Mike’s BBQ in South Philly. The vegan Phoagie sandwich features hoisin-painted eggplant and other seasonings reminiscent of a bowl of pho. The chutoro tuna and caviar nigiri is pictured at Royal Sushi and Izakaya in Philadelphia's Queen Village. Keystone ice cream bars come in a variety of flavors that get dipped in house-made chocolate then custom-dressed with toppings. This dark chocolate-dipped coffee ice cream bar was adorned with cashew, caramel and Cape May sea salt.